Anatomy & Physiology Made Incredibly Visual! 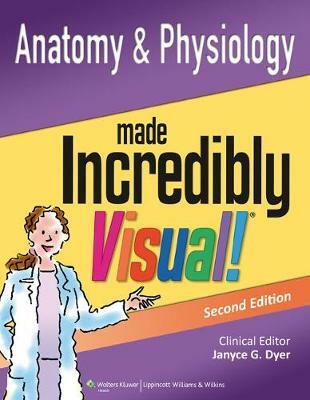 Anatomy & Physiology Made Incredibly Visual is an innovative new reference that brings clinical subjects to life using a vivid, graphic presentation. Like the Incredibly Easy series, the Incredibly Visual series takes difficult clinical topics and presents them in a clear, concise, easy-to-understand manner. The highly visual nature of this book makes anatomy and physiology fundamentals accessible to the reader in a unique and interesting way that enables quick review and comprehension as well as practical application. For each body system, the book logically first presents anatomic fundamentals necessary to understand the complex physiology of the body. Then physiologic processes are presented more visually than ever before. This new approach to clinical content maximizes the power of visual thinking by getting readers as close to the clinical content as they can get without actually being in the room with a patient. Complex ideas are broken down into their component parts, with each component made unmistakably simple in appealingly colorful and graphic ways. Readers will read less, understand more, and see things more clearly than ever before.